Here he is, sitting on top of MY cat tower. 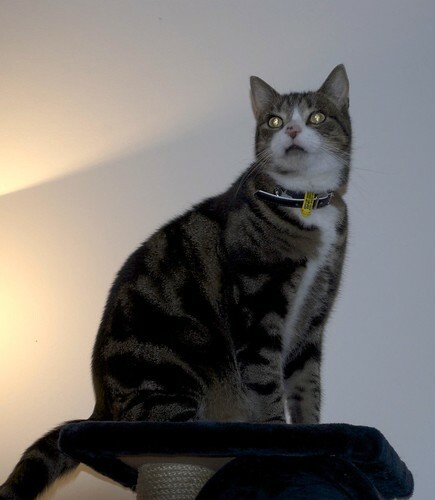 So what if I never climb up there; it's MY cat tower and I am in charge of who gets to climb it. Things with Cosi and I are not going so well. He is a lot bigger than I am and keeps trying to jump on me so I get really scared and my tail gets all puffy and I hiss at him. Yesterday morning mum and dad had to separate us and put him in time out so I could get some peace. It's only 19 days til he goes home. I can last til then, right? If not, I might go back to Zimmie's where it's safe. 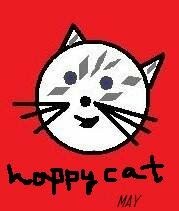 This week I received the Happy Cat Award from my lovely friend Sherkhan. 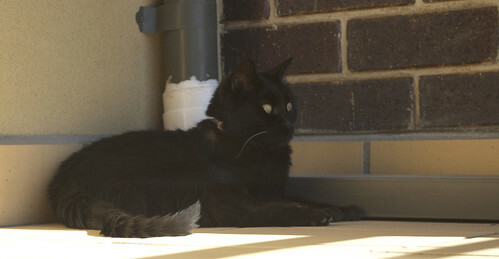 He's a ragdoll cat who lives in Melbourne not very far away from me. If you don't know him, please go and say hello! The rules say I have to list six things that make me happy, then pass this award on to six of my friends. 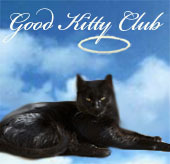 I am also a member of the Good Kitty Club. 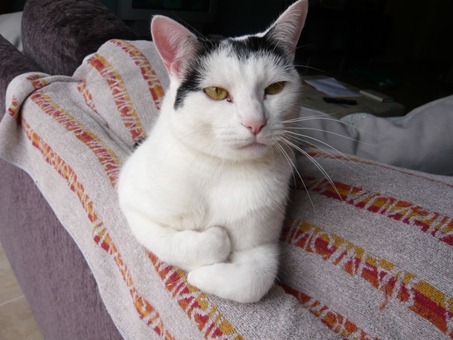 How can I be in the Naughty Kitty Club AND the Good Kitty Club, you ask? 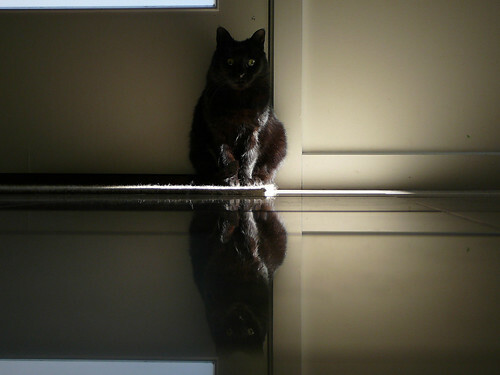 Well I am a black cat and I can do whatever I like! 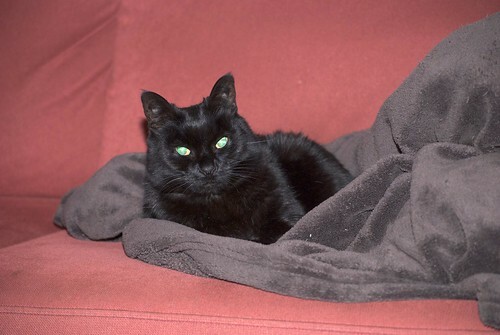 It has been cold here this week so I have spent a lot of time snoozing on MY toasty couch blanket that Mrs Shelli made especially for me. Sometimes I climb under the blanket and make a Huffle cave. That's really good. A cat never gets any peace. Even when I'm having a bath the pupparazzi are following me and taking photos of my every move. Maybe I can train Cosi to be my bodyguard? This is an older photo of me on the balcony, but since it's been raining most of this week I haven't been able to get out there and sun myself properly, or visit with the neighbours. I hope they don't miss me too much. 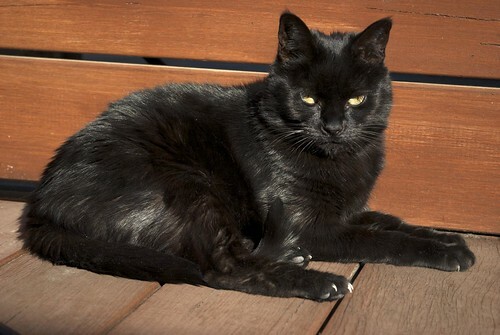 This weekend, the weather was cold but very sunny so I spent a bit of time out on my deck soaking up some rays. Because it's nearly winter here, our deck only gets a bit of sun for part of the day so I have to take advantage of that. Mum and dad have unlocked my cat door again (it was locked when Cosi first got here so he couldn't run away) and I get to go outside when I want. It's much better that way. So as you know, Cosi has been staying with us. He's been here for nearly two weeks now, and things still aren't going that well. He has settled in pretty well, but I don't want to be his friend. This is the closest we've been to each other. 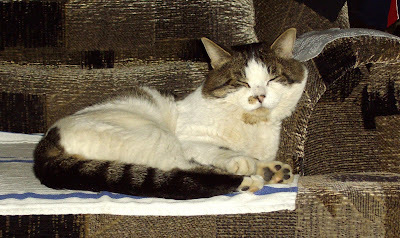 And this was the only time he came near me and I didn't hiss at him. I was coming down the stairs and he was going up. This is my new friend Whiska Pusskat. He's been blogging a little while and doesn't get many visitors so if you could please go over and say hello, I'd really like that. 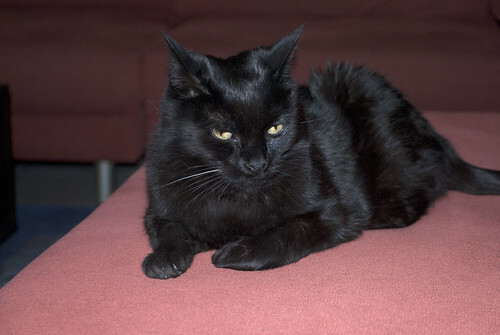 Also: he has just been diagnosed with Feline Leukemia and FIV and his person is understandably upset. The gorgeous girls over at Casbah Kitten - Jane and Alice - shared this award with me this week. I am supposed to share it with four friends who remind me of the four colours of the mood ring. Blue: my bestest friend Zimmie used to always wear a blue collar (like mine!) until his mum made him a new one. I want to share this with him and his brother and sisters. Pink: the kitties over at Katnip Lounge are in the pink with their awesome catio and wonderful mum and dad who keep rescuing more kitties. Orange: the fairly wonderful Ginger Jasper is a big orange boy who has to endure a lion cut every summer, thanks to his mum. You deserve an award for that, GJ. Green: makes me think of my friend Oscar, who is currently undergoing chemotherapy for cancer and who needs all the good thoughts we can send his way. And green is good, right? Thanks again, Jane and Alice! 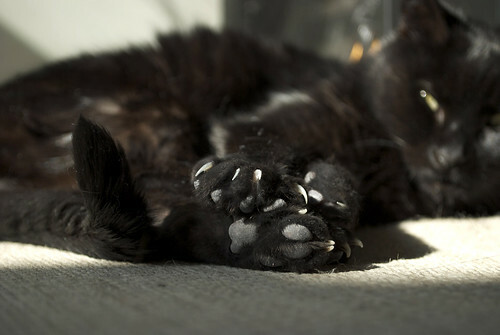 This is a photo of my paws. I know, exciting right? 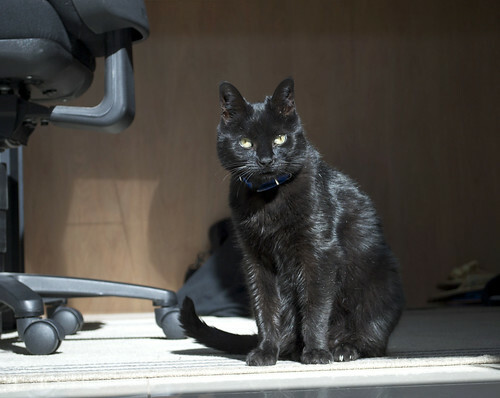 But I wanted to point out to you that when I first arrived here four and a half years ago, I had perfectly pristine black paw pads. 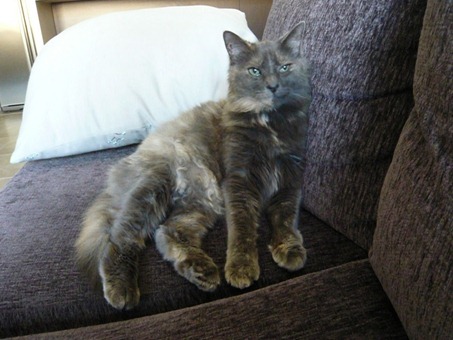 That's because I'd been in the cat shelter for more than three months and I never got to go outside very much. And for a few months mum and dad didn't let me outside here because they didn't want me to run away. 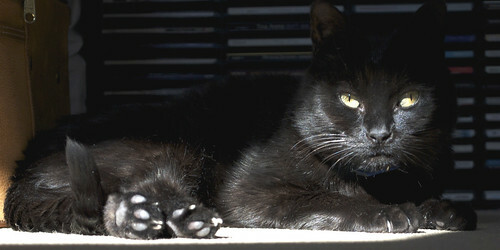 Eventually I was allowed out in the back yard and ever since then my paw pads are much tougher, and they've gone grey. I hope you don't like my paws less because they're grey. Today I would like you to meet my friends Spider and Smudge. 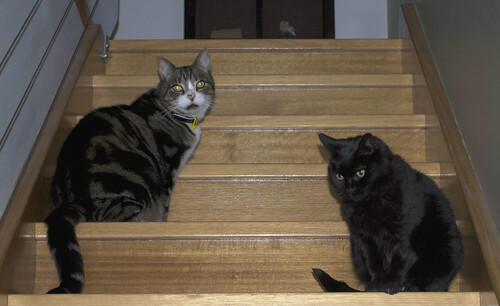 They are kitties who live in Canberra, Australia, with their human mum. Spider is all black like me and Smudge has some white patches. Please go and say hello, and tell them Huffle Mawson sent you! I decided to sneak in a Thursday on the Balcony this week because the weather has been just a little bit warmer (I don't think that it will last too long) so I managed to spend a little bit of time out there. For the past few nights, mum and dad have been putting the toasty couch blankets on the bed, because it's been cold (it is nearly winter, after all) and I don't think they had properly adjusted their body temperatures after coming home from Russia. I love it because I had my very own toasty blanket on the bed - the one that Mrs Shelli made especially for me with my name on it - and dad put it right in the middle of the bed so I was extra toasty at night, tucked up between mum and dad. 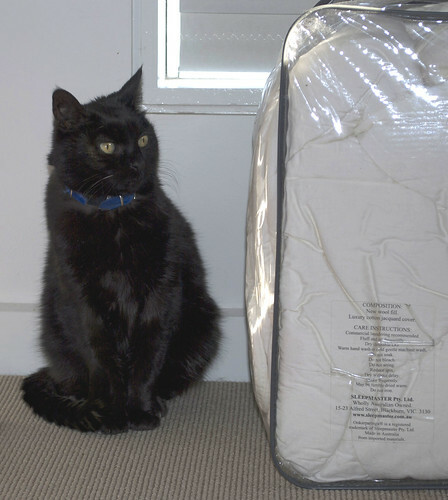 But now... today mum put the other doona (duvet, comforter) on the bed, which is thicker than the other one, so she says we don't need the toasty couch blankets on the bed any more. Where am I going to sleep now??? 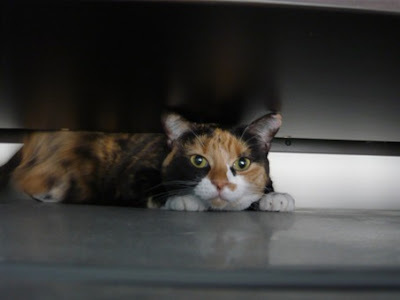 This is Cosi. I don't know if you remember a few months ago when his dad brought him around to my house for a visit, as our parents wanted to see if we would get along okay. I was not very nice to Cosi because, well, he reminded me a lot of poo-face Salvador and we all know how mean he was to me. Cosi is now staying at our house for a month. His mum and dad have gone to Japan for a holiday (his mum is Japanese) and he is staying with me. 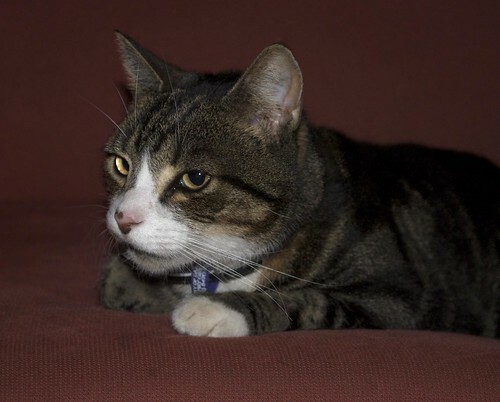 So far I have hissed at him a few times and he looked at me funny once but mostly he sleeps under the bed in the spare bedroom and I sleep on mum and dad's bed. I don't know if we're going to be friends yet. My dear friends the Kitty Trio gave me this award last week! 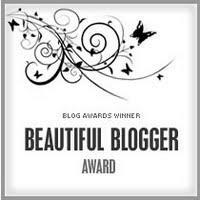 It's the Beautiful Blogger award and I am supposed to share seven things about myself. 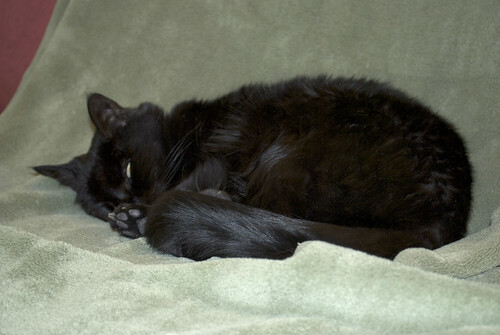 Even though I am a black cat, I have two white hairs on my back. Lots of people think I am a boy, mostly because of my blue collar. But I'm really a girl. I have had exactly one prawn in my life, and it was the BEST snack ever. I wake up dad by headbutting him - today it was a headbutt in his tummy. If I have to choose between a lap with a toasty blanket and one without, the toasty blanket lap wins every single time. I like to get in the shower after mum and dad. I queue up in the bathroom for my turn. I have never eaten any flowers IN the house. Outside is another story. This award has been around for a while, and I don't know who has it and who doesn't. If you don't have it already, please share it! And tell me seven things about you. 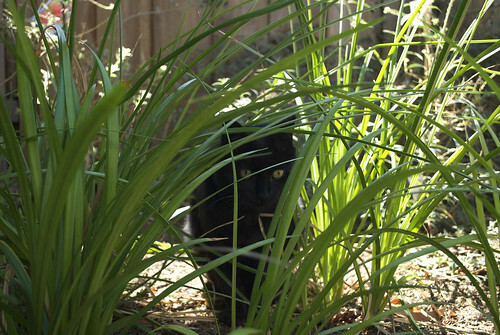 I think that if you can't see me, that means I'm not eating the plants. 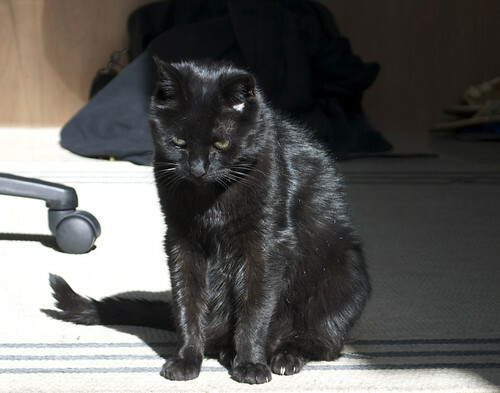 The weather this week has been so cold that I have to find all the sunny spots inside to toast myself. I was minding my own business here but then I thought that maybe someone should move that chair for me so I have enough room to really stretch out. I don't think that's too much to ask for. Normally I do Thursday on the Balcony but it's getting colder here as we head for winter so I am not spending much time on the balcony these days. 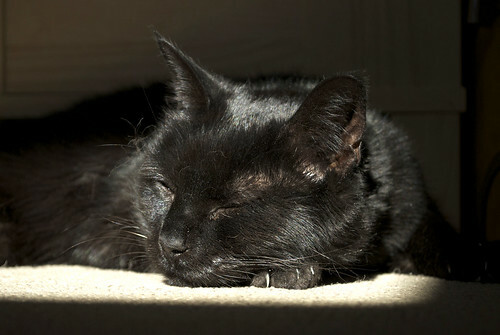 Instead, I find spots in the sun inside the house and hang out there. And then I have to cover my face with my paw because the pupparazzi show up. A cat never gets any peace. My friend Oscar had his first chemotherapy treatment yesterday. Please keep giving him and his people support through this tough time. A while back I was contacted by a man asking if I would read and review his book on my blog. I did read it before the holiday but then ran out of time to talk about it. Better late than never! If you like a laugh and looking at cute pictures of kittens saving the planet, this is the book for you. It's a short read - about 25 minutes, if you can tear yourself away from the pictures. I laughed very hard as I was reading this book. 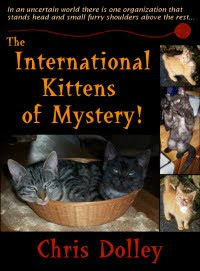 It was very entertaining and the kitten pictures are absolutely adorable! I would highly recommend this to anyone wanting to have a laugh. You can buy the book electronically (for Kindles and such or as a PDF to read on your computer). It's only $1.99 and well worth it. Check it out here. 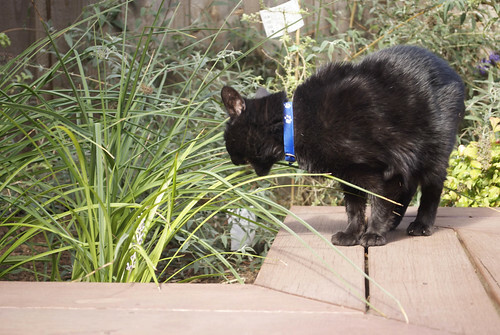 I'm not eating the plants. I'm... yelling at the bugs to get out of my garden. About eleventy million years ago, my darling friend Fin gave me an award. It was just before mum and dad left to go on their holidays so I never got a chance to post it. I'm making up for that right now. Each recipient must share four things about themselves that represent the four colors of the mood ring: Pink, Blue, Orange and Green. Oka, here we go: Pink because I'm a girl. Blue because my parsley pot was blue. Orange because it reminds me of sunshine. 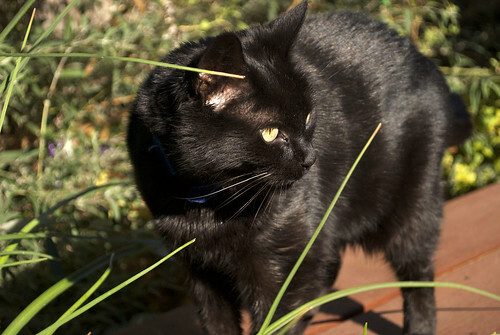 Green because my cat grass used to be green, once upon a time. Each recipient must choose FOUR COLORFUL friends to give the award to. Don't forget to say who they are and give a link to their blog. If you'd like, add in a little something about why you've chosen them. Once again, photos are optional but always fun. 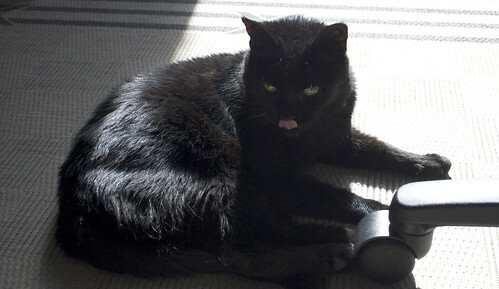 I've never met a cat who doesn't like having their photo (a flattering one of course) online for the world to see. This is way to hard to choose, so I'm going to give this to everyone who visits today. I hope Katie doesn't get too mad with me. I can't follow rules though. 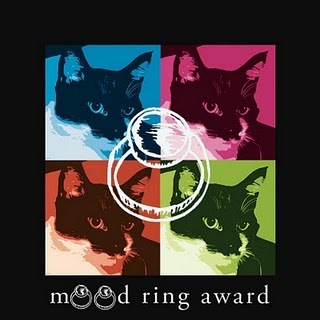 Be sure to post the MOOD RING AWARD badge in your blog post and a link back to your friend that gave you the award. Of course you should thank the person who gave it to you. p.s. sorry about the weirdo fonts. Mum tried to fix them and I think she made it worse. It's hard to get good help these days. Actually there are no shenanigans to be had today. It's been a long week and mum has been sick for most of it. I felt so sorry for her I let her take this photo of me. I hope every pup and every kitty has some sunshines this weekend! Um hello. Sorry I didn't post yesterday. SOMEone (not me) forgot. To make up for it, I am introducing you to my friends Kenji, Keiko and Priscilla. Their blog is called Kitty Trio and they live in Australia just like me! Please go and say hello. Tell 'em Huffle Mawson sent you! And while you're out visiting, could you also please go say hello to my friend Oscar? 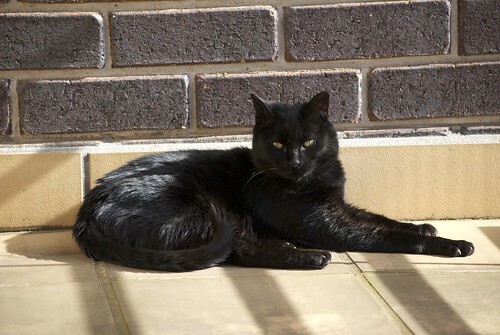 He's a black cat who lives in Melbourne like me and he got some bad news from the vet this week. I've told you a million times, evil pupparazzi: GO AWAY and stop taking photos of me! Because I am annoyed with mum and dad for not bringing me a present from their trip, I am refusing to look at the camera this week. 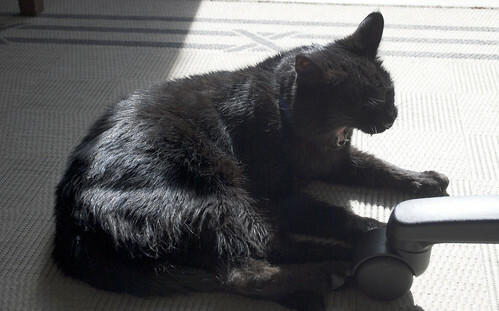 Actually this a photo from a little while back, I have not let mum take any new photos of me since they came back and she is worried about what I am going to use on my blog this week. I told her that nobody comes here for the pictures... right? So while mum and dad were away, Uncle Heath came and stayed with me. We had a very good time and he even fed me organic roast chicken for dinner. When mum tried to give me regular roast chicken after they came home, I wouldn't eat it. Ha! Uncle Heath also played red dot with me, and I slept next to him on the bed every night. Well, except for when I was visiting my bestest friend Zimmie. But please don't tell mum and dad about that, okay? Also: they did not bring me any presents from China, Kazakhstan, Uzbekistan or Russia. This is Very Bad News. There are sketchy reports today that Huffle Mawson, Honorary Husky and Explorer Cat, is refusing to get out of bed, saying her blanket is "too toasty".